The second big high school all-American game of the year happens this Saturday at noon when at least six future Horns take part in the US Army All-American Bowl on NBC. No expected new commits for Texas at the game but it will be a chance for fans to see a bunch of future Longhorns compete against top notch talent. The most interesting commits to watch may be quarterback [tag]Connor Wood[/tag] and running back [tag]Traylon Shead[/tag]. In these wide open all-star games QB and RB are two of the spots where you get the best reflection of what a player is actually capable of. Shead is one of the most prolific prep running backs in the history of Texas high school football and today will be a great chance to see what the stud from tiny Cayuga can do against the country’s best. On the defensive side of the ball watch for defensive end [tag]Reggie Wilson[/tag] and linebacker [tag]Tevin Jackson[/tag]. Both players are incredible athletes who can fly around the football field. With the pass happy game plans it should mean lots of chances for Wilson to get after the quarterback. 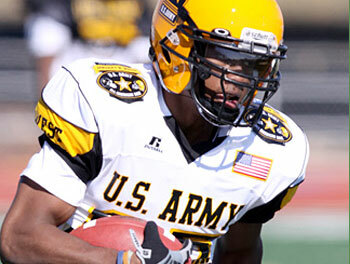 View the full US Army game rosters.